After reviewing 2018, I thought it would be natural to do a little post on planning my sewing and crafting in 2019. I’ve decided to give Make Nine another go as it was kind of helpful for me to plan my makes for last year, though I didn’t finish everything. 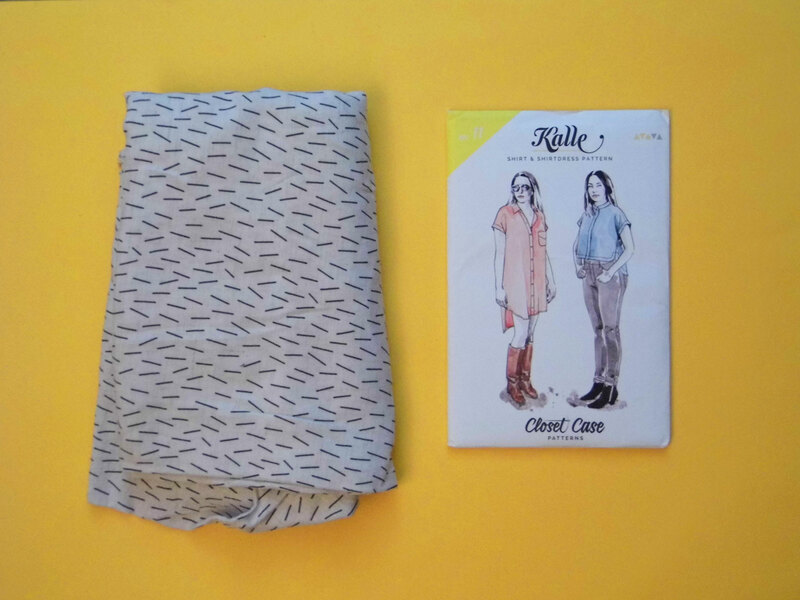 I have added the 4 things I didn’t make onto the list again – and I think for the 3 Closet Case Patterns this is the 3rd year they’ve been on my make nine, so this year I really have to make jeans and pyjamas! 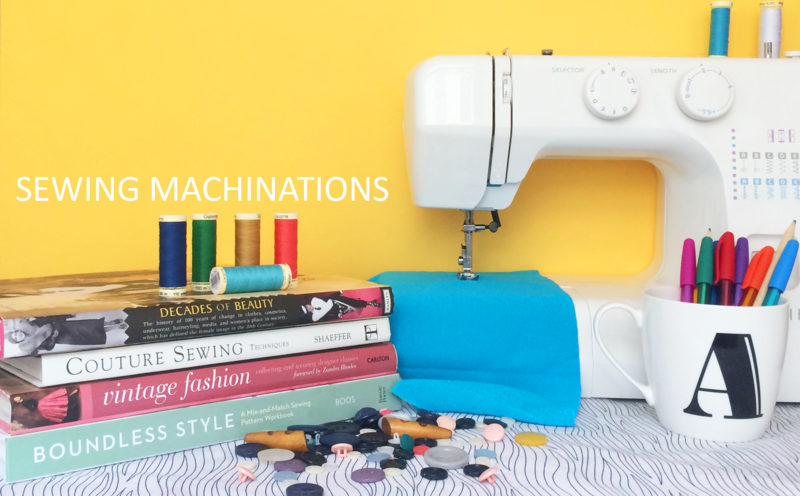 I have all of these patterns and I really want to stick to the Acton being the only ‘every day’ dress I make – I’m going to the Dressmaker’s Ball in March so will probably make a dress for that. I also want to do some more knitting this year – I’ve rediscovered knitting this Christmas break and I’d forgotten how great it can be to do in front of the TV. I’ve almost finished a jumper for myself which I cast on 3 or 4 years ago and then I’ve promised to make my partner a jumper from some yarn I had in my stash. I’ve also bought a couple of embroidery patterns so I can do those over the course of the year. 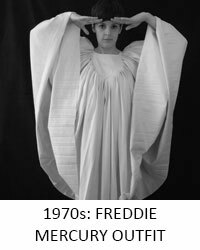 I also want to make a couple (or a few) more projects for my Hundred Years Wardrobe. I’m going to see the Dior exhibition at the V & A and I’m so tempted to make a Dior outfit to go in but I suspect I won’t have time. 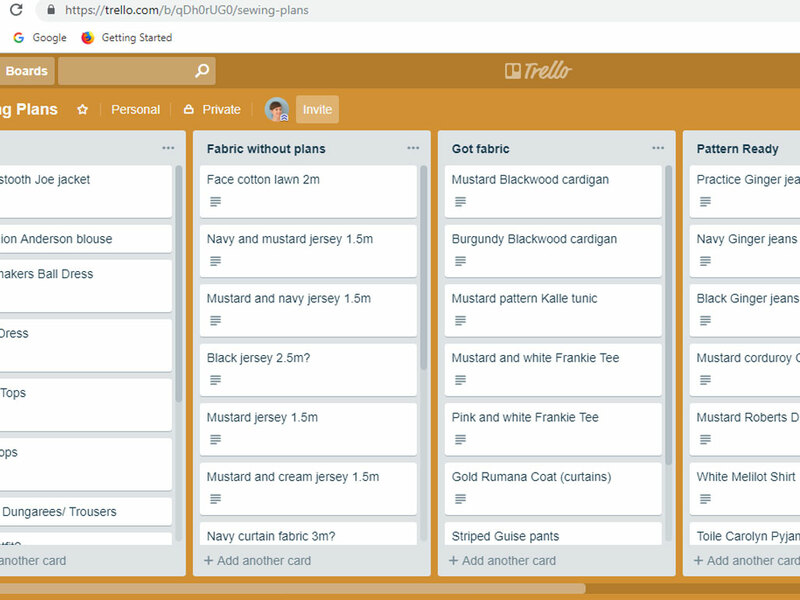 To help me to be organised this year, I’ve signed up for Trello, as recommended by Helen on Love to Sew and by Jen from Gingerella on her Instagram recently. I’m already in love with it and have probably planned out at least a year’s worth of projects, if not 2 years! Are you making plans for the coming year or are you more a ‘fly by the seat of your pants’ kind of sewist? March was definitely a light sewing month for me, despite the Easter long weekend we just had. I think since making my coat (which I still love so much I slightly don’t want it to warm up so I can keep wearing it! ), my sew-jo has dissipated a bit. I’m not sure why, but I’m hoping it comes back soon. 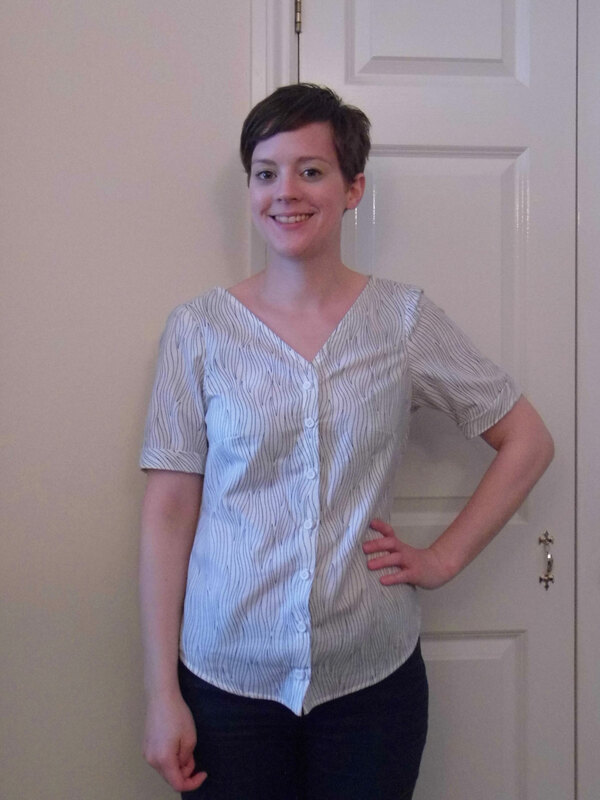 The only item I made was this Kalle shirt, with the hidden button placket. 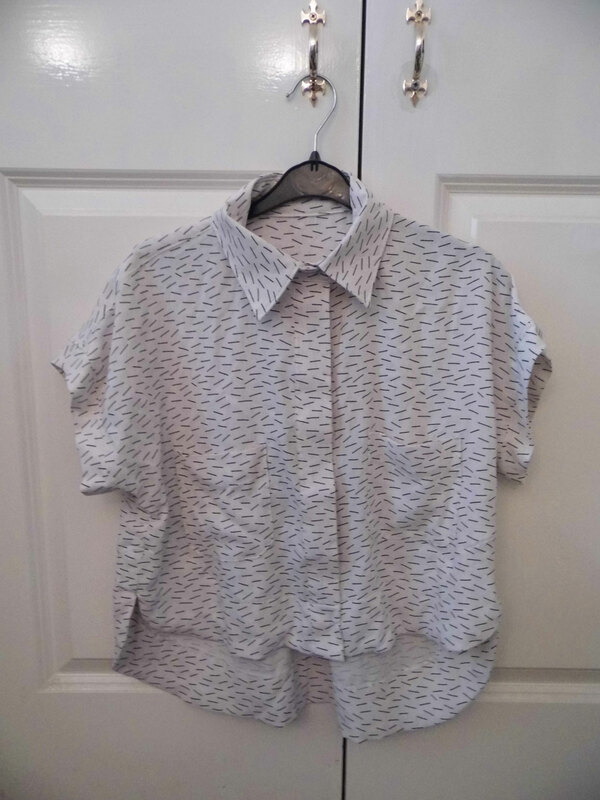 I intended to get it finished in time for the Sew My Style deadline, which I think was the 25th, but it still doesn’t have buttons (but it counts as a finished make as the buttons will take me, like, 10 minutes). 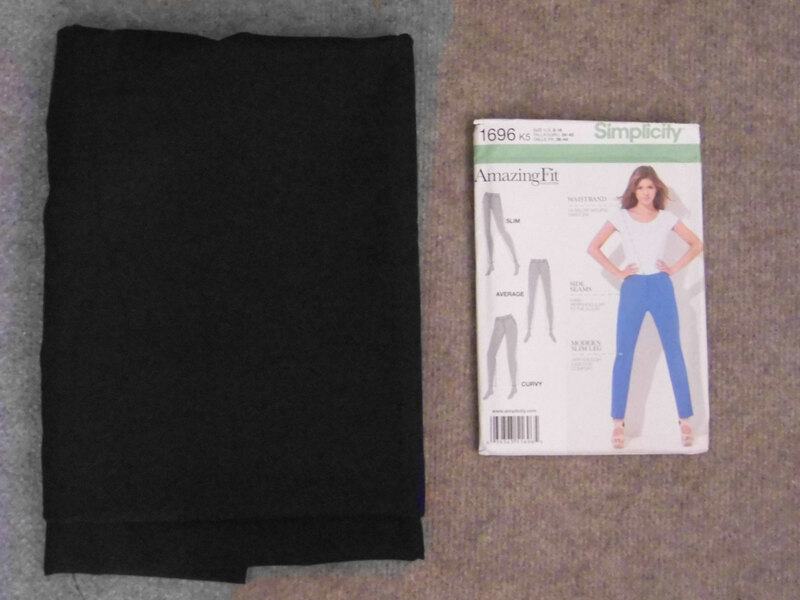 My first make of April will hopefully be another paid of the Simplicity 1696 trousers which I made in navy blue last year. I wear them all the time and could really do with a black pair. I bought some black twill last year during one of my fabric shopping trips to Birmingham. I originally had another plan for the fabric but trousers will be a more useful addition to my wardrobe. It’s hopefully going to be trousers month in Machinations towers so my other main plan is to finally make a start on jeans. 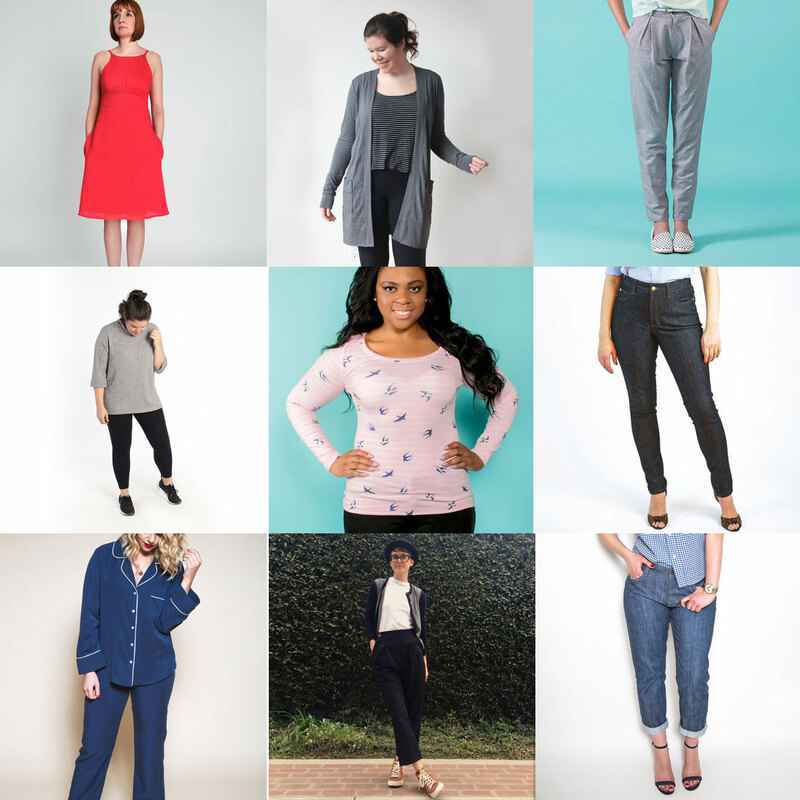 When I made my plans for the year, I planned one of my make nine or the three Sew My Style for each month and April and May are for the 2 Closet Case Patterns jeans patterns. I think I’ll start with the Morgans as they aren’t as fitted, but are presumably drafted using the same block so I’ll know which adjustments I’ll need to make to the Gingers to get them to fit. I still need to prepare both patterns but I’m hopeful I’ll have some jeans by the end of the month. If I have time (which seems very. 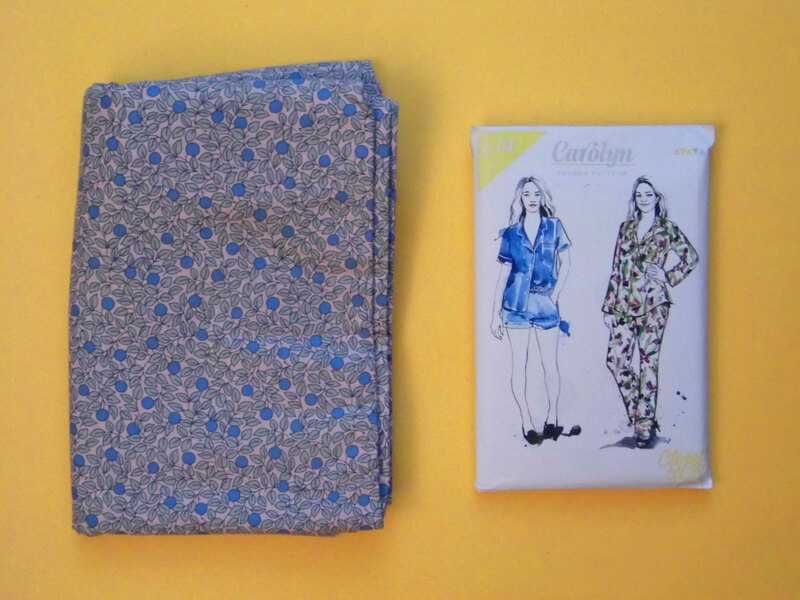 very unlikely) I’m still planning to make some Carolyn Pyjamas. In other blog news, for the last year or two I’ve been trying to blog twice a week, though if you check the dates I publish posts, you’ll see I almost never achieved it and then I felt bad about missing my own schedule. 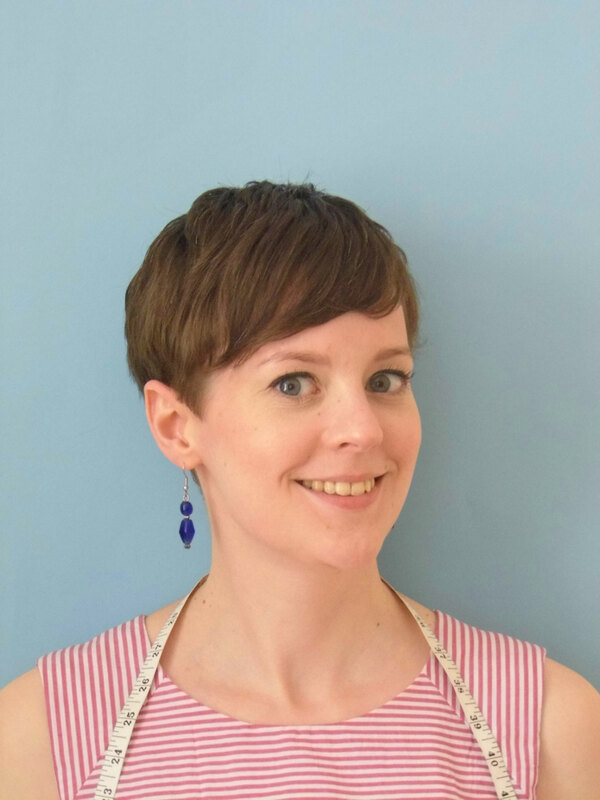 So I’ve decided to write one post a week – with an additional one here and there if I have lots to share, though with my current sewing output, this seems unlikely! Well it’s been a while! I didn’t mean to take a break from the blog but I felt quite down through most of February and just wasn’t in the mood to blog. I did finish my coat, though, which is pretty amazing! 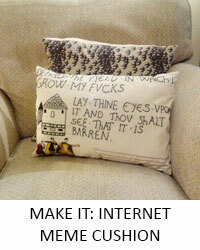 I was in the mood to sew but not to write about sewing. Weird. But I’m back and I have most of March already planned with posts for things I made in January! I’m a little backed up! My only make for February was my coat – but I knew that would be the case, and I actually really enjoyed taking my time over a bigger project and learning some new skills to boot. This is just a sneak peek – I thought it would be a good idea to take advantage of the apocalyptic snow we had last week to take some nice Wintery photos……maybe it would have been a better idea to have waiting until it had actually STOPPED snowing!? 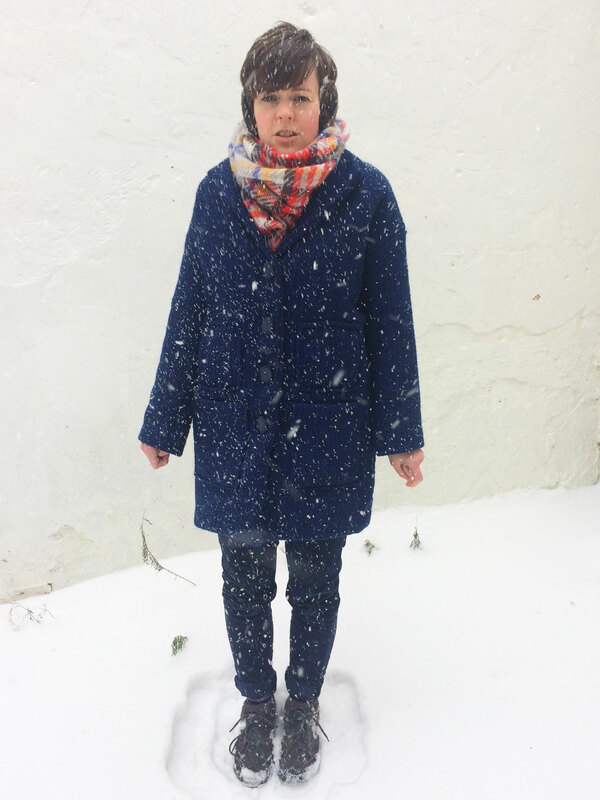 I do have better photos for my forthcoming post about my adventures in coat-making, I promise! Now onto my plans for March. 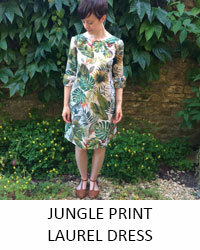 As I mentioned in my post about my plans for the year, I’m going to try to join in with a couple of months of the Sew My Style challenge and March is one of the months I’m going to join in with as it’s the Closet Case Patterns Kalle Shirt/Shirtdress and this was on my to-make list anyway. I’ve got this lovely cotton/linen blend (I think) from the Great British Sewing Bee Live. My only questions is: which version do I make? I’m tempted by the cropped version, but with the proper collar. 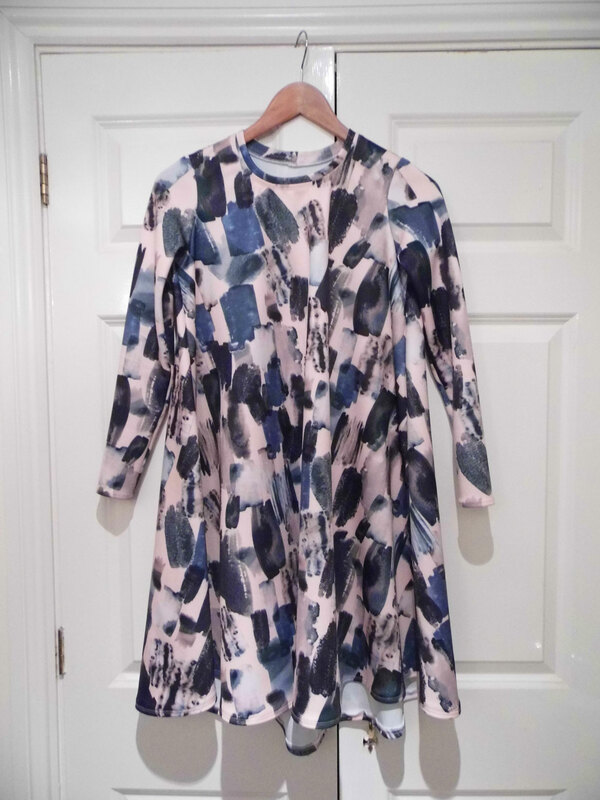 Or I could make the dress version – I don’t actually have any shirt dresses, though I do have a lot of other dresses so it feels like I’m more in need of separates at the moment. 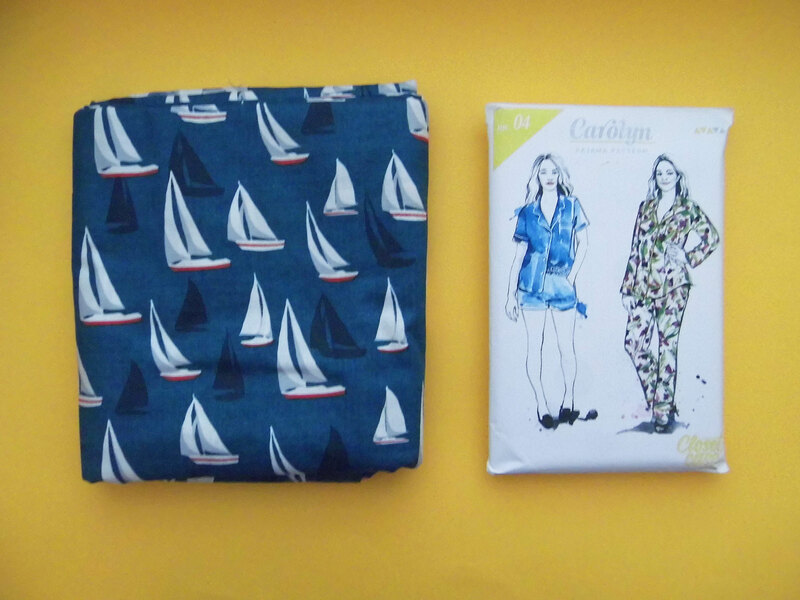 My other main plan for March is to finally make some Closet Case Patterns Carolyn Pyjamas, which have been on my to-make list for months and months. The pattern is one of my Make Nine so I really need to tackle it this month! I have this slightly ruined liberty fabric, which I bought years and years ago on Goldhawk Road. I carefully pre-washed it……with some other fabrics, one of which was pink and stained everything else. The other fabrics weren’t quite as stained as this one, though, so I thought this would be the perfect practice fabric for the pyjamas because there is 3 metres, it’s still nice quality, and the discolouration won’t matter for pyjamas. Then when I’ve made the practice version, I’m going to finally cut into this gorgeous boat-y liberty fabric my friend gave me ages ago! I have red and white striped piping already, too, as I want to pipe this pair. I think both versions will be long-sleeved and trousers as our flat is really quite cold and even in the heat wave we had last year, I didn’t really sleep in my Grainline Lakeside Pyjamas which I made the previous year as it didn’t feel super warm indoors, even when it was 34 degrees outside! (For reference I currently have a blanket and a hot water bottle on my lap and it’s not as cold as it was on Thursday/Friday last week!). I think this should be enough to keep me occupied throughout March. What are your plans for the next month or two please? 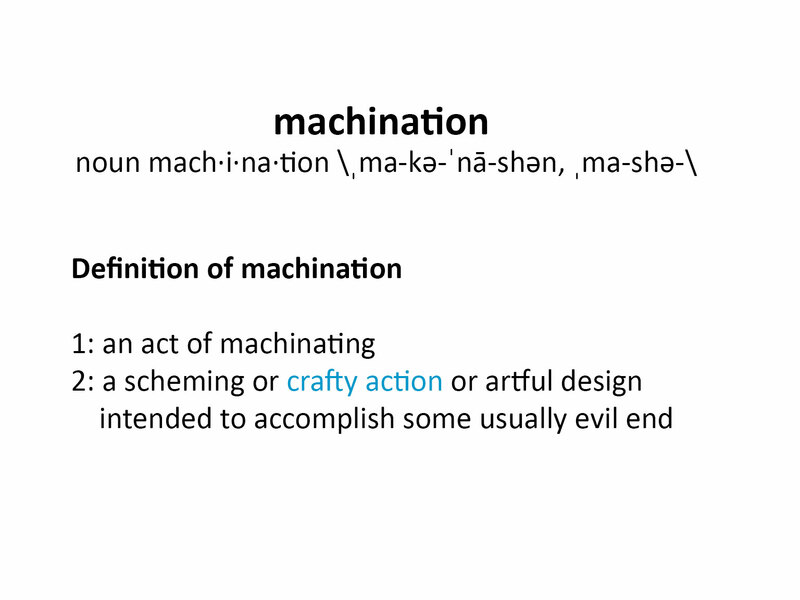 I haven’t done one of these planning posts for a couple of months, but I want to get back into the routine so I’ll be more mindful and thoughtful in my sewing. December wasn’t super productive for me, what with Christmas and everything. 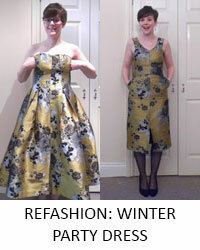 I think I technically finished my New Craft House Party dress in December, though made most of it in November. I did make the only 2 presents I successfully made in December – I also made another moss skirt for my sister, but it didn’t fit her because I forgot that the last time I made it, I reduced the seam allowances. 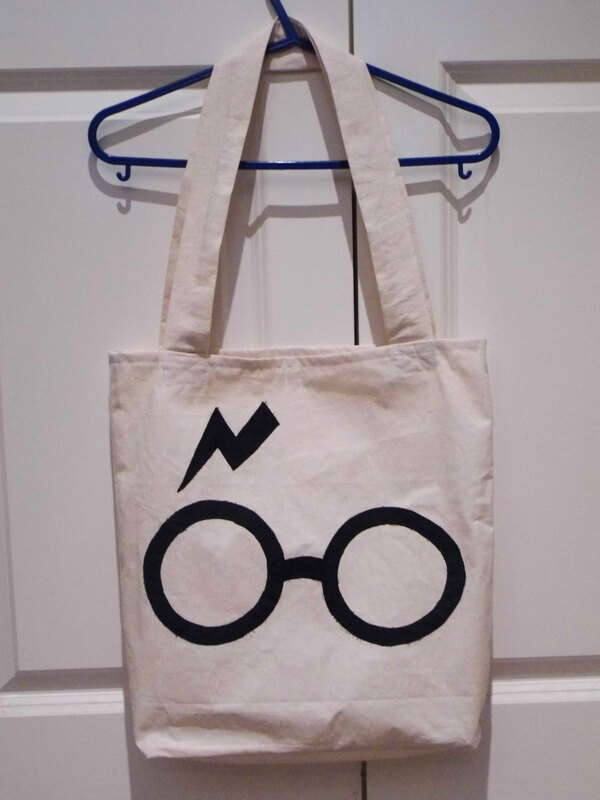 I did make 2 Mini Chestnuts for my friend’s daughter and this Harry Potter tote bag for a secret santa present. The tote bag might have actually sneaked into January – I’m sure I’m not the only one who loses track of time over Christmas and New Year! My first make of 2018 was my Chestnut sweater, which I blogged earlier this week. I really do love it! 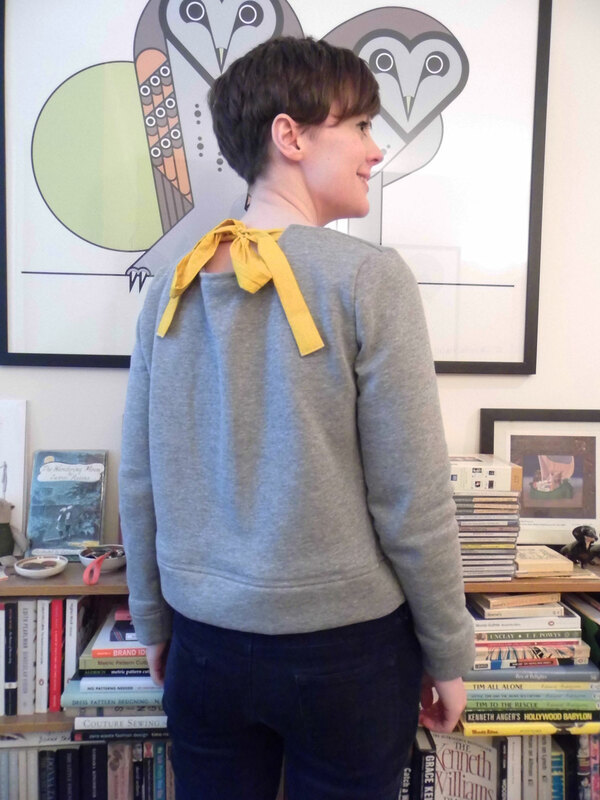 You can read about how much and the gorgeous snuggly sweatshirting I used in the post. I also made 2 Ebony dresses from 2 different scubas and I love them both! And they’re really quick to run up. 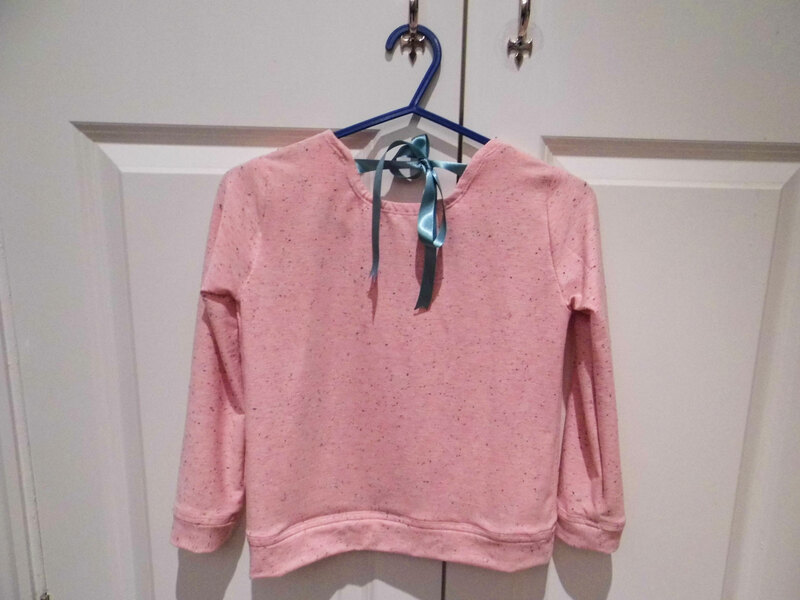 I made half of a linden sweatshirt, but I was using a not very stretchy ponte for the sleeves, the neckband, cuffs and hem band but it wasn’t anywhere near stretchy enough to work for the neckband so I put it to one side and started on another project. I’ll probably finish it off this weekend. 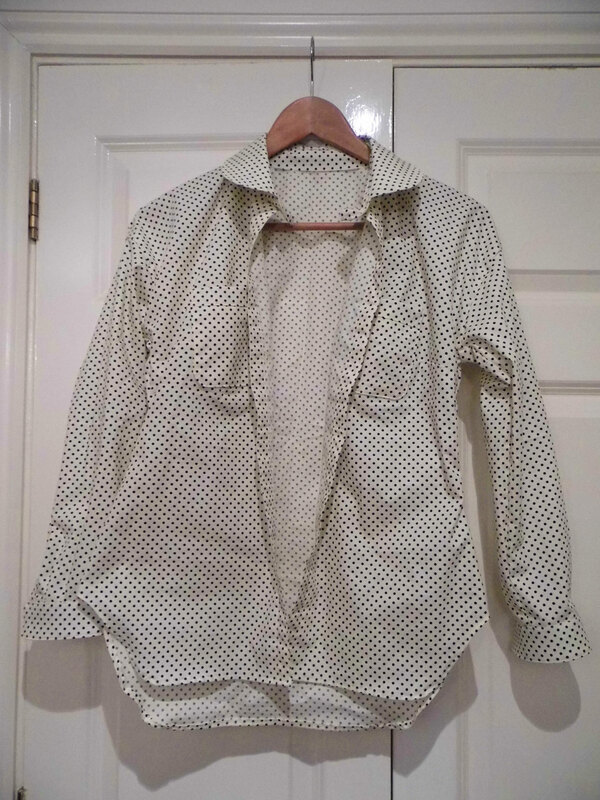 And finally last month I made most of this spotty melilot shirt, which I’ve been planning to make for a few months I think. I’ve just got the collar stand to stitch down and topstitch, and then the buttons and button holes. I really do like shirt making, it’s so satisfying when all the pieces come together and you get to do some lovely topstitching! So onto my plans for February. I’m going to finish the melilot and linden, hopefully in a single morning. Then my main plan is to make a coat – my first proper coat. 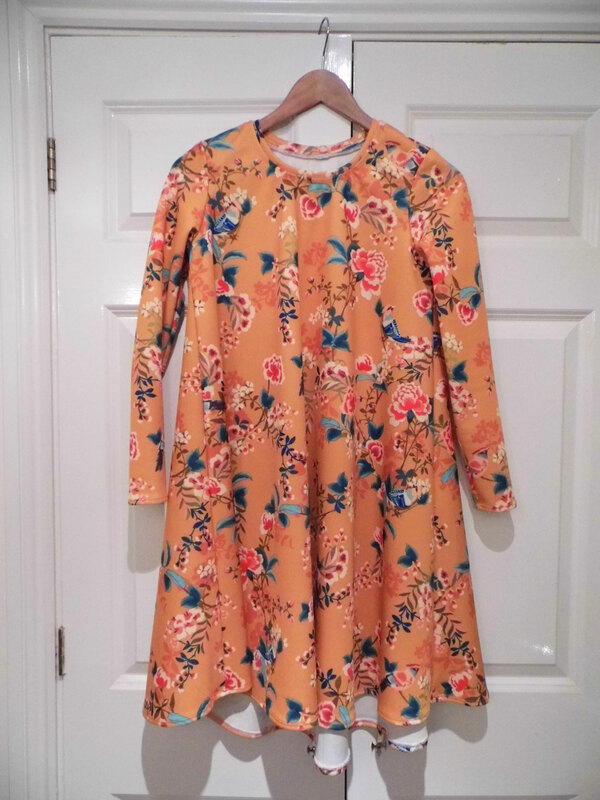 I refashioned a coat a couple of years ago but there was none of the structure you actually need in a coat, the lining is just cotton and rolls to the outside of the coat because there is no facing. 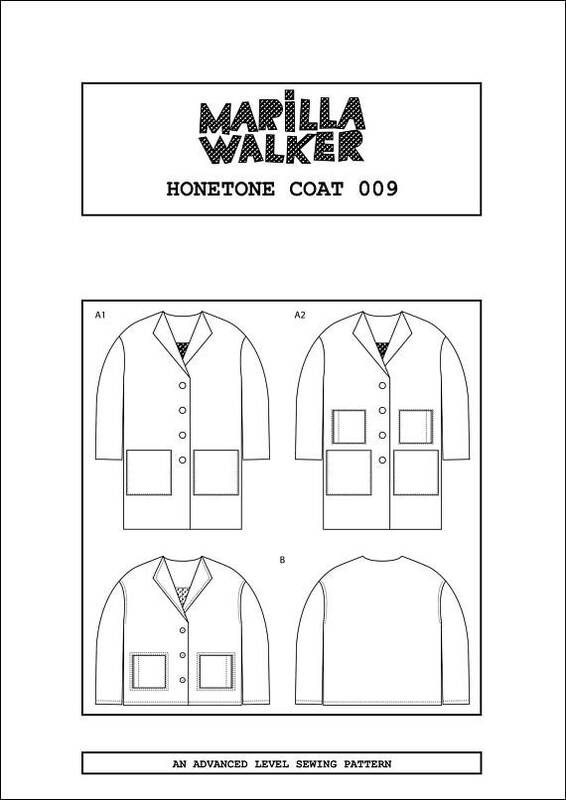 As per my #2018MakeNine the pattern I’m going to use is Marilla Walker’s Honetone Coat. 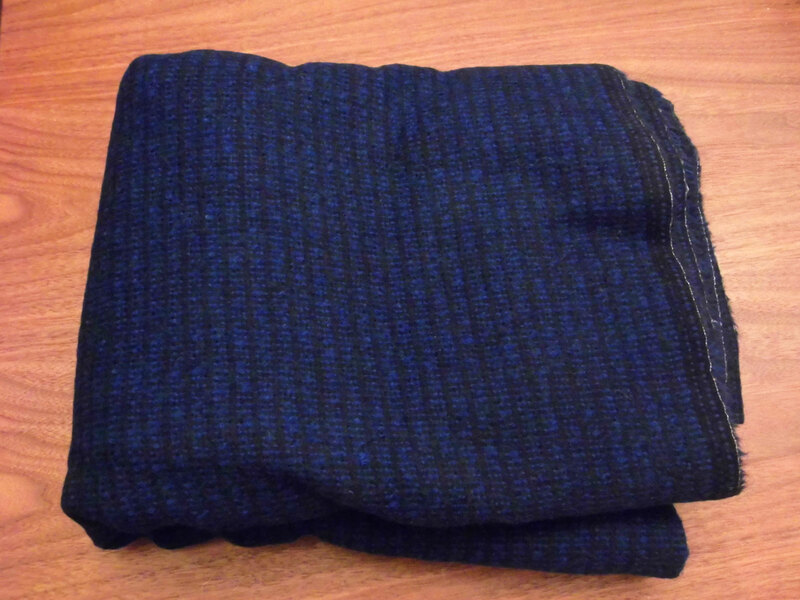 The fabric I’ve got is some lovely electric blue and black wool I bought from Barry’s fabrics at Sew Brum. I don’t have any lining fabric yet – I want it to be the electric blue colour but I haven’t found anything I like so far. I also don’t really know what kind of fabric would work well as a coat lining – I don’t want to use that cheap acetate lining fabric. Any ideas of a good coat lining, I would be greatly appreciative! I think this is the least I’ve ever planned for one month, but I want to take my time with the coat so it’s something I can wear for a long time and in cold weather – I might try to underline it with thinsulate or fleece or something. Again any tips gratefully received! I had a week off work in July, so I’ve had quite a productive month – though some of the makes haven’t made it to the blog yet. But my main project for my week off was to rebrand my blog (and all social media), which took longer than I thought! But it was good I had a week off so I could spend a few days blitzing it – I probably wouldn’t have got around to it if I’d been trying to do it during weekday evenings! I seem to have recently mostly made tops! 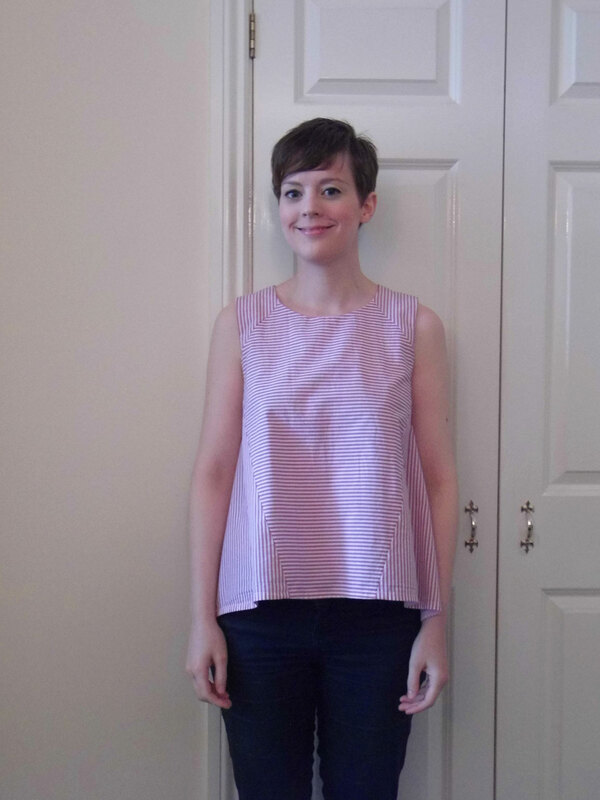 First I made this pink striped In The Folds Collins Top, and I love it! 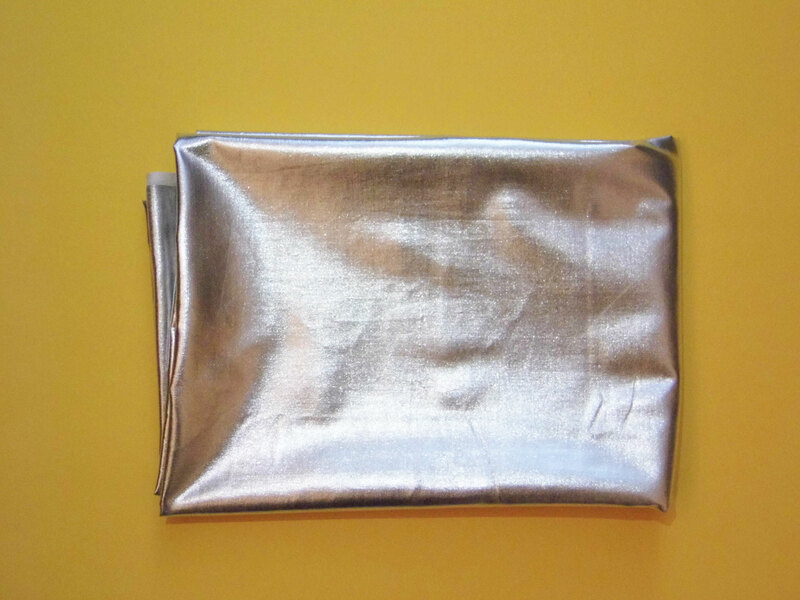 I’ll go into more detail in my post about it, but I’ve already got fabric in mind to make another version! 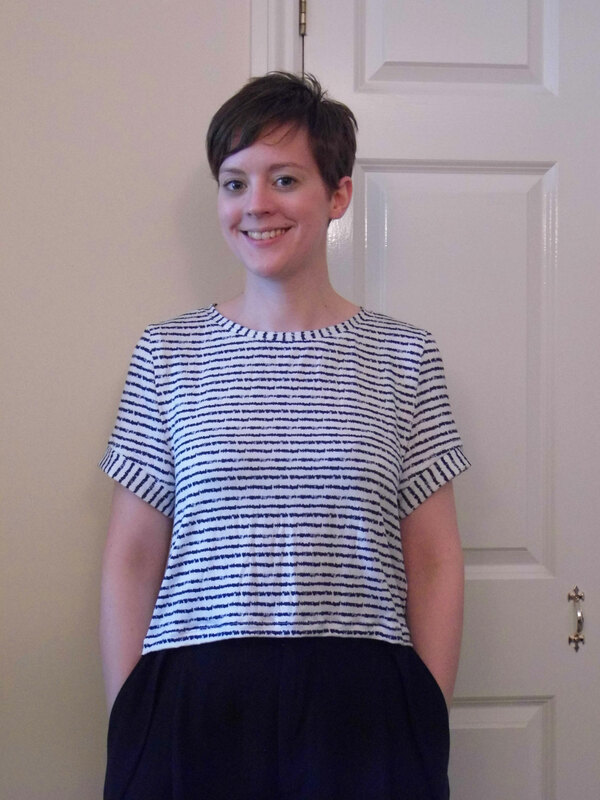 I also made this cropped Named Inari Tee out of leftover fabric from my Marianne Dress. This was sort of a wearable muslin, but I think it turned out okay! My last make for my week off (I seem to have not made much outside of my holiday from work!) was this Colette Aster blouse. Again I’ll go into more detail when I write it up into its own post, but I’m not totally in love with this and I’m not sure why! Now onto my plans for August – I don’t think I’ll get much made this month because I’m home visiting family next weekend and in the middle of the month I’m going to the New Craft House Summer Party so I won’t have a huge amount of sewing time this month. I’m thinking another Inari Tee, though probably lengthened by an inch or two so there isn’t so much of a risk of exposing my midriff, which I don’t really like. I’ll need to also make something to wear with the top, or I may cause a sensation! I’m thinking some culottes from the Butterick pattern which was free with (I think) Love Sewing magazine. Any other ideas? 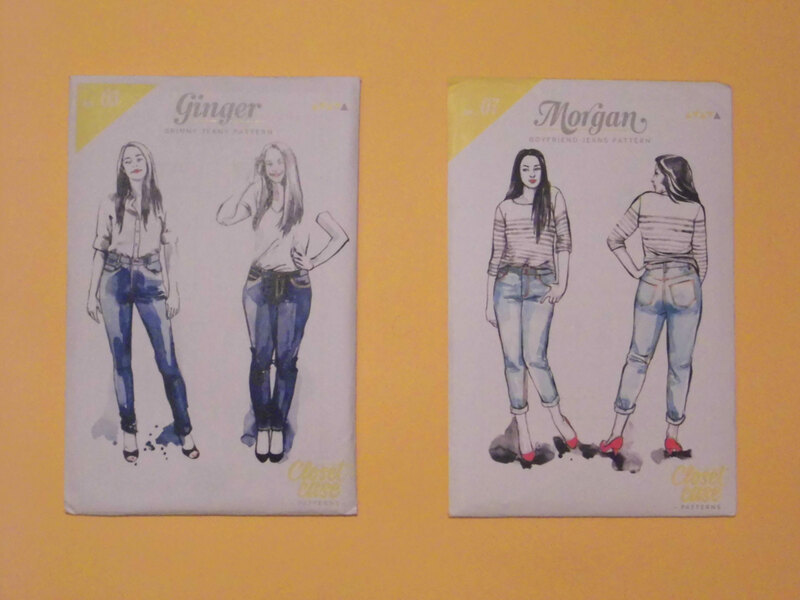 If I have any spare time in the rest of the month, I really do need to make a start on jeans. It’s been sooooo many month of me planning to make them that it’s getting a bit ridiculous now! I know it may not seem seasonally appropriate to make jeans in August, but with the British Summer, it will probably be the perfect time!